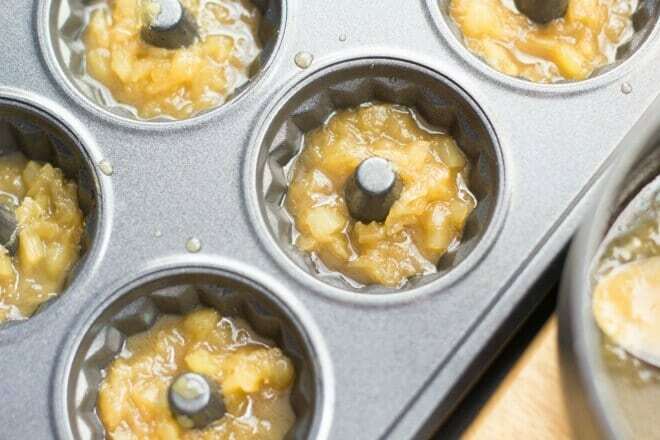 This simple recipe makes darling pineapple upside down cupcakes that offer big, delicious flavor. If you’d love to try the “real thing”, check out our recipe for pineapple upside down cake. If you’re really into pineapple right now, make sure you check out this Grilled Pineapple Sundae and this Pina Colada Split. Upside down pineapple cake has always been a favorite of mine. I love its rich cinnamon and brown sugar aroma wafting from my kitchen. Today we’ll be making pineapple upside down cupcakes but this recipe is yummy in the big size version. 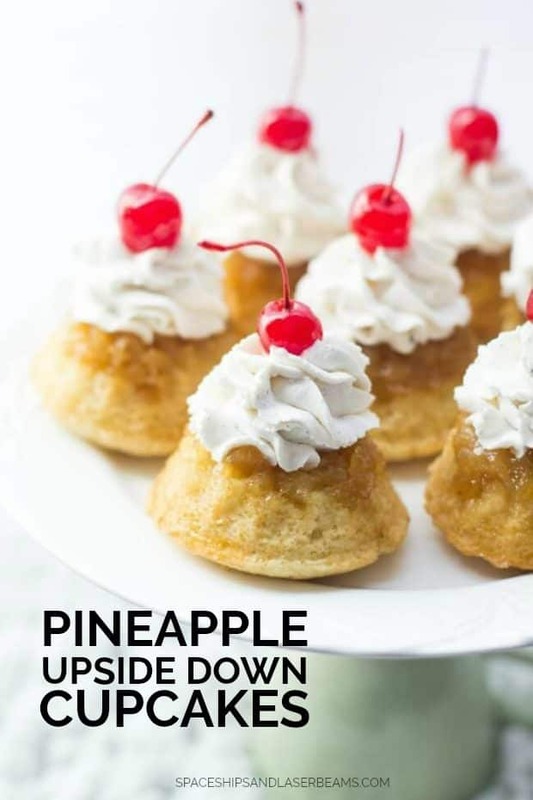 Pineapple upside-down cupcakes make wonderful personal sized desserts, just right for sharing with family or company…or maybe for an indulgent-mom moment. Who doesn’t love small things? A mini Bundt cake pan makes it easy. But you can make these in muffin tins, too. These have a very subtle flavor. You can substitute pineapple juice for milk if desired. I love pineapple, so I always think adding a little more pineapple flavor is the way to go. In a small saucepan, combine butter, pineapple, brown sugar and cinnamon. Bring to a boil and reduce to simmer. Simmer for 3-5 minutes while preparing cake batter. In the bowl of a stand mixer add dry ingredients. In a separate bowl combine oil, milk, egg and vanilla. Whisk until eggs are broken; slowly add to dry ingredients. Mix until just combined. 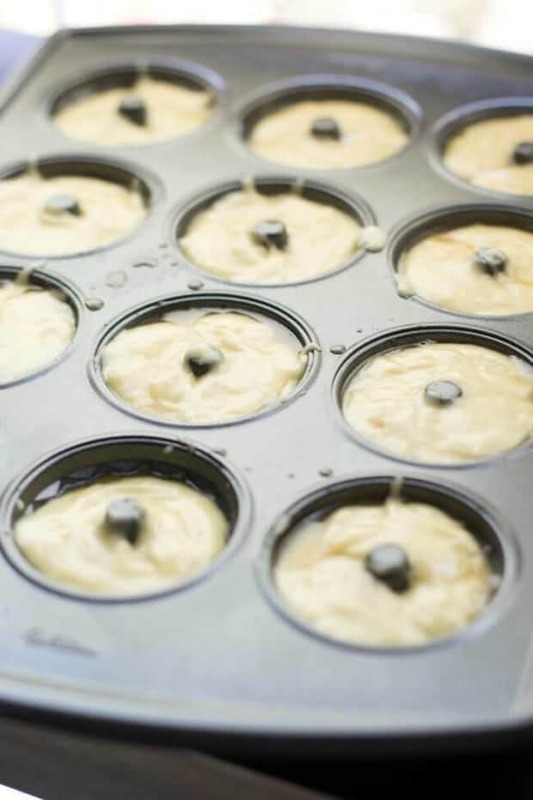 In a mini Bundt pan or muffin tin, spoon 1 tablespoon of pineapple mixture into the bottom of each mold. Add two spoonfuls of batter on top and spread around. This batter made just enough for 12 mini Bundt cakes. Bake at 325 for 15-20 minutes. Allow to cool and turn over onto a baking rack. While cakes are cooling, whip whipping cream, cinnamon and vanilla until stiff peaks form. Scoop into a piping bag and pipe onto cakes using tip 2D. Top with a cherry. 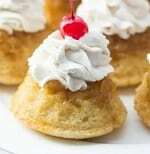 Adding whipped cream topping bumps the dessert into the impressive realm. And a cherry on top? Divine! So go ahead: make someone happy with this recipe. 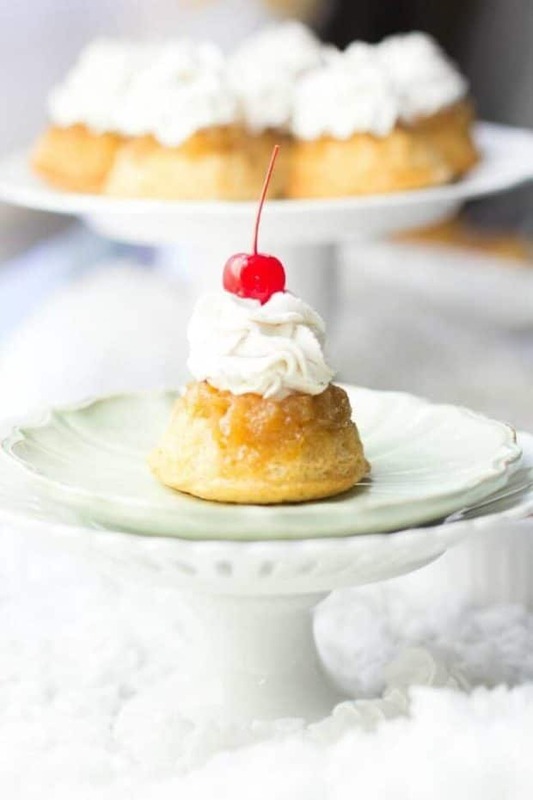 They’ll be dazzled with your mini pineapple upside down cake! Try this delicious classic Banana Pudding. This Oatmeal Cake is delicious. 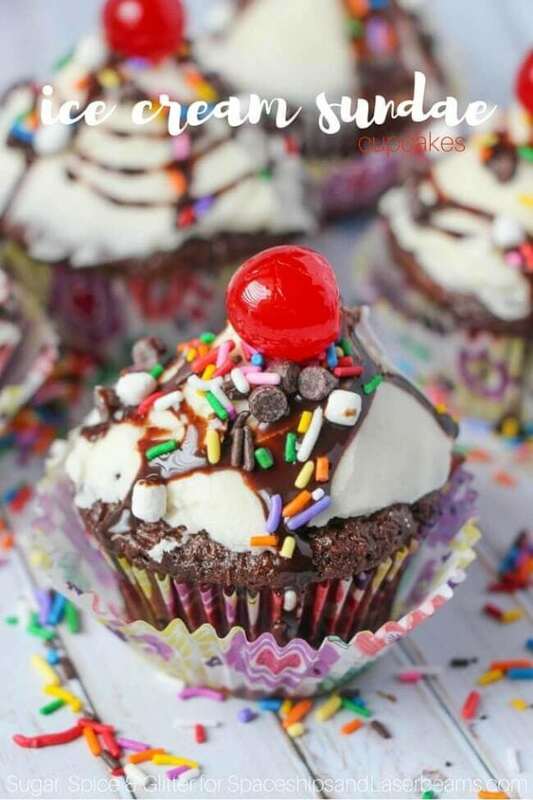 Get inspired with these genius Cupcakes Recipes. Try this Carrot Cake Recipe for another great twist on a classic. These classic pineapple upside down cakes with cinnamon and brown sugar are perfect in mini form! In a small sauce pan, combine butter, pineapple, brown sugar and cinnamon. Bring to a boil and reduce to simmer. Simmer for 3-5 minutes while preparing cake batter. In a mini Bundt pan (should have 12 mini Bundt molds), spoon 1 tablespoon of pineapple mixture into the bottom of each mold. Add two spoonfuls of batter on top and spread around. This batter made just enough for 12 mini Bundt cakes. Bake at 325 for 15-20 minutes. Allow to cool and turn over onto a baking rack. Note: These have a very subtle flavor. You can substitute pineapple juice for milk if desired. My kids about died over these cupcakes! They loved them! Me and my friends are happy with this recipe! We loved these cupcakes!